Trailing sweet peas. Great in baskets. 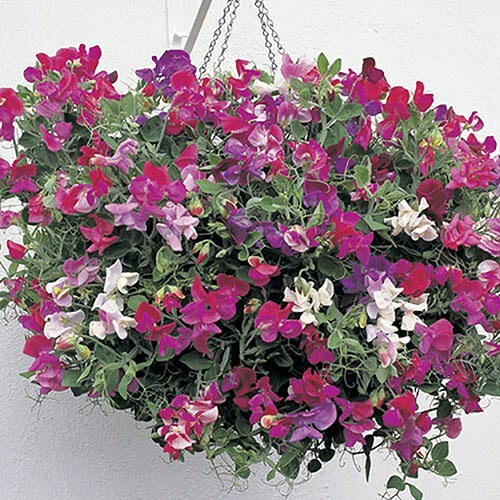 Sweet Peas in your hanging baskets are now possible, ultra-compact and sweetly fragrant! In a ravishing mixture of colours, including some bi-colours, brightening any part of your garden. mixture of colours in shades of red, pink, lavender, blue, rose & white. Supplied as 12 mixed coloured Jumbo Plugs, each one multi-sown with approx. 4 plants per plug. Sweet Peas in your hanging baskets... Yes, now it is possible! This ultra-compact, gorgeously sweetly fragrant variety will fill your whole patio with the unmistakeable fragrance of sweet peas from May until September. In a ravishing mixture of colours, including some bi-colours, it will brighten any part of your garden you plant it, although ideally, it needs to be in a hanging basket or another position where it can trail. The plants have been selected to flower profusely and blooms will appear along every inch of the stems so you will have a globe-shaped display! Note - the Plug Plants you receive will have been multi-sown and contain approx. 4 plants per Plug. Do not tease the individual plants apart, but simply plant them in their plastic net pot! A mixture of colours in shades of red, pink, lavender, blue, rose & white. Supplied as 12 mixed coloured jumbo plugs in netted pots (2.5 - 3.5cm diameter), each one multi-sown with approx. 4 plants per plug (therefore a total of 48 plants). Flowers May September. Plant whole pot - do not tease apart! Plant the special net pots as they are, do not tease apart the plants. Patio sweet peas work well when grown in containers and hanging baskets without other plants to create a delightful and eyecatchihg display. Alternatively, they can be grown with other plants where they will wind their way up the stems to create spectacular effects. For best results,'stop' the plants by removing half an inch from the tips soon after planting, this will encourage branching giving an even bushier plant with more flowers. Be sure to deadhead any old flowers as this will keep the flowers coming and extend the season right up to autumn. Supplied as 12 jumbo plugs (2.5 - 3.5cm diameter) in netted pots, each multi-sown with at least 4 plants. Do not tease the individual plants apart in each netpot - plant the whole pot into the pot or soil.